Scroll down for the #TwitterSmarter conversation report for September 1st, 2018 EST. When it comes to participants, we ranked 60th among 431 conversations. In terms of the number of posts, we ranked 60th out of 431 conversations that took place. This conversation ranked 46th out of 431 in terms of the amplification of ideas & content. There were 21 reshares, 60% of posts, during the course of the conversation. 60% of participants in this conversation shared a total of 6 unique pieces of content. Twitter no longer allows sharing of similar content multiple times. If you are looking for an alternative, we conducted an experiment of retweeting our own top tweets. We found that this strategy increased the tweets' impressions by more than 100%! 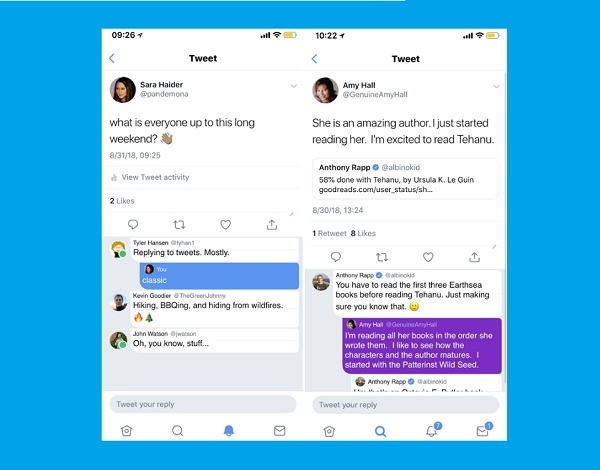 Twitter's testing out a new way to show tweet replies, and indicate when users are active. Do you want to know the perfect Twitter image size for every visual you create for Twitter? We've made it easy for you in this post by showing you an effortless way to create the right size Twitter images every time.